There are some films that just don't pale with age. Instead, they ripen in our psyches, to be enjoyed over and over with new appreciation each time we watch them. 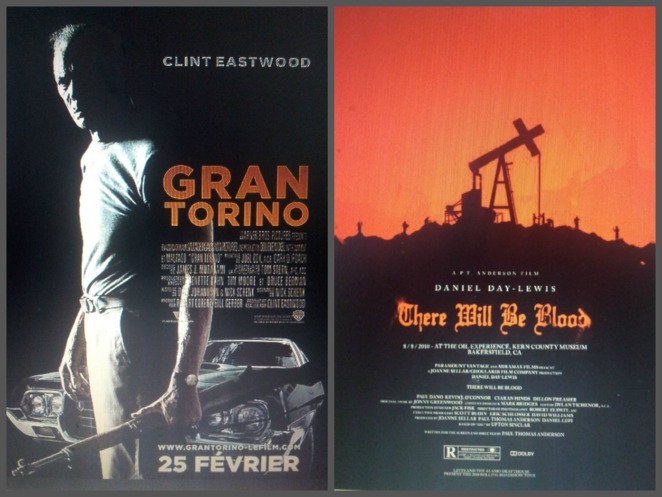 But rarely do we get the opportunity to actually see these beloved classics again on the big screen. Blacktown's Max Webber Library has changed all this, however, with the offering of free monthly big screen movies on Sunday afternoons. 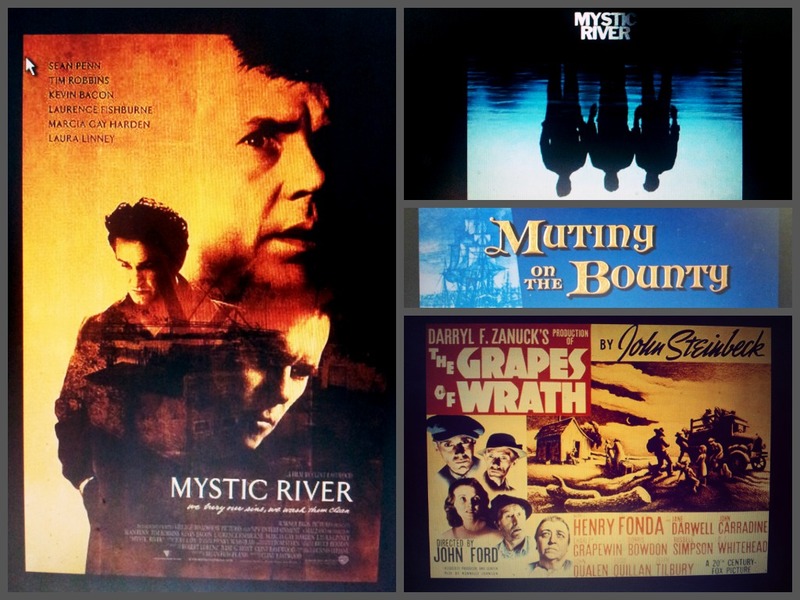 This year already, they have put on a number of favorites including 'Mystic River', 'The Grapes of Wrath' and most recently, 'Mutiny on the Bounty'. Happily, free movie screenings are offered by a number of libraries, universities and cultural organisations. They are a great way to get out of the house, enjoy a free film and interact with the other viewers. It's easy to find out about these screenings as well - just keep your eyes open for flyers on community notice boards. Also, join local libraries near you that offer them; when a screening is imminent it will be advertised on their website. Coming up in June and July two more recent big screen movies are to be screened at the Max Webber Library Function Centre. Sunday 16th June at 2pm there will be a screening of Clint Eastwood's in your face production - 'Gran Torino'. Rough and raw, it is the story of an elderly war-veteran who finds that the country he fought for hasn't become the place he expected. A great watch with the sort of performance at which Clint Eastwood excels, and lots of one-liners to boot. 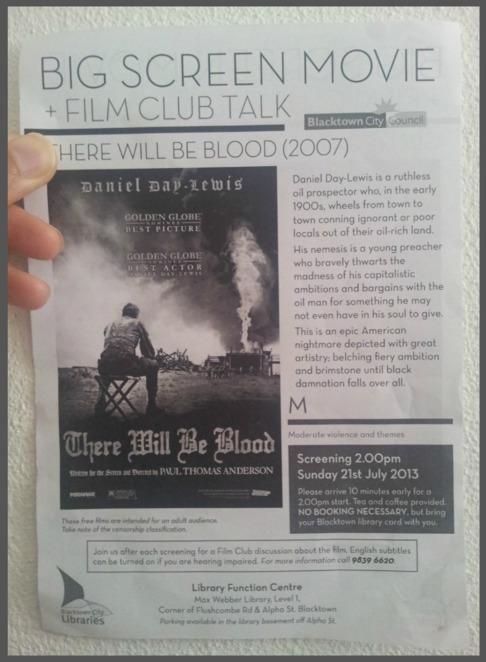 July's movie is the dark 'There Will be Blood'. This applauded film starring Daniel Day-Lewis was inspired by the Upton Sinclair novel 'Oil!'. A troubling tale, it tells of the rise, and increasingly violent decline of a South California oil man absorbed by his pursuit of money. The films are each followed by a Film Club discussion in which you may join, with tea and coffee provided at each of the screenings. As mentioned on the Blacktown Library website, the film club is all about enriching the viewing experiences of the area's residents. The group discussions revolve around the films, the actors and movie trivia. For any viewers who may be hearing impaired the library will also display subtitles on the film upon request. Screenings are usually at 2 pm on a Sunday - but check out the Blacktown Library website each month for exact dates and times. Booking is not required to attend screenings at the Max Webber Library Function Centre, but you will need to bring your Blacktown Library membership card along on the day. It's no hassle though, as you can join online or at the Blacktown Library for free by presenting proof of your name and current address, as long as you are an Australian resident. So forget about expensive movie tickets and sitting solitary on chewing-gummed seats in a dark theater. Be a part of these shared free community events at the library, and lose yourself in an easy Sunday afternoon silver-screen show.